home / STARTicles / How Does the New Tax Plan Affect Independent Workers? In 2017, the US Bureau of Labor Statistics reported a 56 percent increase over the past ten years in workers considering contract work to be their primary means of employment. Likewise, Intuit – the makers of TurboTax – estimates that the gig economy comprises a whopping 34 percent of the American workforce and expects it to rise to 43 percent by 2020. In other words, self-employment is as ubiquitous as it’s ever been, and that leaves nearly 53 million people wondering how the new tax plan passed by Congress in December affects them as sole proprietors, LLCs, c-corporations and s-corporations. So, how does the new tax plan affect independent workers? Read on to see how it all shakes out. Even in the face of change, a few standards still apply. The deadline to file taxes this year is Tuesday, April 17 (extended slightly since the usual deadline of April 15 falls on a Sunday); specifically, returns must be filed electronically or at least postmarked by the US Postal Service on or before that date to avoid penalties. The process itself isn’t expected to change much, either, regardless of the postcard famously held up by the Commander-in-Chief at a press event last year. Whether or not filing your taxes on a half-sheet of paper will ever become a reality remains to be seen; in the meantime, workers can expect a similar process to years past – just with a few changes thrown into the mix. “Most of the Republican tax plan will kick in beginning in January, but taxpayers will not see every change immediately,” writes Alicia Parlapiano in The New York Times. In the short run, that may mean good news for small business owners who operate as sole proprietors, c-corps and s-corps. As everyone files their taxes this spring, components of the new plan will already have taken effect, while others won’t kick in until next year. 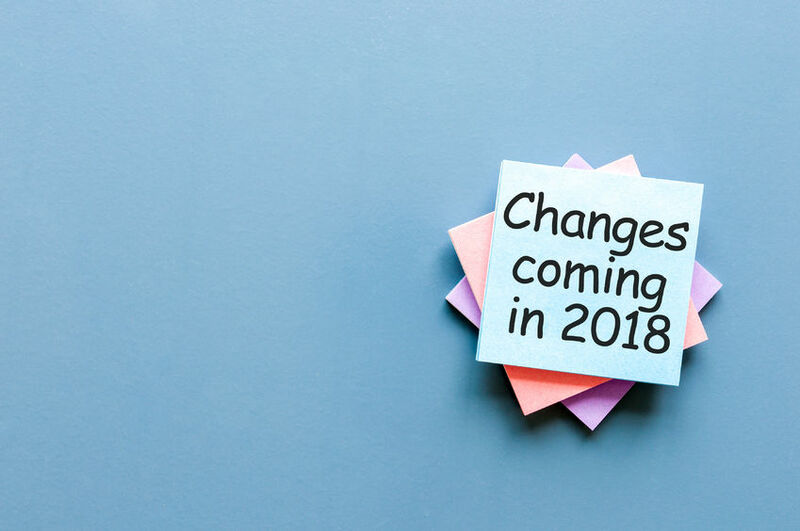 So, having a conscientious, well-read accountant or tax professional in your corner is as important as ever, although for those who prefer a DIY approach, reputable preparation software should be able to navigate users through this year’s changes without missing a beat. Analysts have made much of the pass-through provision the overhaul allows for sole proprietors, partnerships and s-corps. Beginning with earnings collected in 2018 (i.e., not to be taken advantage of until next year’s filing), 20 percent of qualified business income can be deducted, often resulting in either a greater return or less money owed. A phasing out of such a deduction is in the works, though, for individual filers making more than $157,500 and for joint filers making more than $315,000, according to the Times. Only those making less than those amounts will qualify for the deduction, which could result in hundreds or thousands of dollars saved. This pass-through provision doesn’t apply to c-corps, which will be required to report their full earnings without the new deduction taken. The good news for those, however, is the new — and ostensibly permanent — 21 percent cap overall. For all the convenience of its immediate returns (beginning next year) for several segments of solo professionals, the new plan does introduce two key drawbacks with regard to the self-employed. The first won’t make itself known immediately, but analysts fear a flooding of the market with new freelancers and solopreneurs at a faster rate than previous years as it appears more lucrative than ever to go into business for oneself. Ironically, though, an influx of new competitors in an already-crowded space is likely to increase supply over demand when it comes to independent workers, creating a tougher landscape in which to survive. The second drawback pertains to giving back in a broader sense: it’s now harder to leverage personal charitable contributions when tax time rolls around. Financially speaking, the new plan makes it tougher to exercise an individual or small-scale form of corporate social responsibility, offering fewer opportunities to write off donations to organizations that once would have counted in a filer’s favor. While contributions made in 2017 still count toward this season’s return at the same rate as last year, this year’s donations won’t be quite as beneficial in April 2019. With the pass-through perk afforded to s-corporations, sole proprietors and LLCs, some c-corp filers might wonder if it makes sense to switch designations and take advantage of that extra 20 percent deduction. And with a 21 percent overall cap on the corporate tax rate, pass-through designees might be thinking about switching to a c-corp designation to take advantage of that guarantee, no matter their earnings. As in years past, though, there’s no single answer that works for all; the only way to safely make the leap from one designation to another is to work openly and thoroughly with a certified tax professional who’s qualified to navigate an independent worker through the murky waters of an uncertain future. For official documents, rules and resources, IRS.gov is the place to go; for additional guidance, check out ChooseWhat’s small business resource center, chock full of helpful information for do-it-yourselfers in need of advice. Amy Lynch is a writer based in Austin, Texas. She’s written for publications and brands including USA TODAY, Google (via EnVeritas Group), Morgan Stanley, InterContinental Hotels Group, Impact Hub and more.